Photo via GRTTWaK I have been an avid listener of the Grown-ups Read Things They Wrote as Kids (GRTTWaK) podcast for quite a while. I often listen and chuckle along to the half-hour-ish episodes while getting ready for work in the morning, a practice which never fails to help me start the day off in a great mood. The episodes are recorded at live events across the country, and I was dreaming of the day that a Charlottetown date would be announced. When such a date WAS finally announced, I made my way to my parents' basement, digging eagerly through boxes of childhood keepsakes when I stumbled upon the most hilarious, perfect story ever, that I knew would be a total hit at the event. But. I turned over the sheet of paper and saw, written in Mom's handwriting - "Rosalyn's Story, 1992". Needless to say, I was devastated. Nothing I'd found of my own, save a very visuals-heavy picture book I'd created at age five (that didn't lend itself to being read in front of a crowd) seemed right. So I was on a mission to encourage my reluctant sister to read her short fiction, "The Foal" that had my parents and I laughing so hard upon our initial reaidng of it as to have tears streaming down our faces. Being an absolutely wonderful sport, Rosie agreed to read the story, and so we submitted an application. I won't put the quote I used to describe the story here, as I feel it would be too much of a spoiler. All I will say, is that Rosalyn unknowingly created a whole new genre of children's fiction, which Dan alludes to following her performance. She told me beforehand that I'd better act as her plant in the audience, and laugh at appropriate spots, in case no one else did, but she needn't have worried, because barely two lines in, the surprised and amused audience chimed right in, enjoying her story as much as I did. 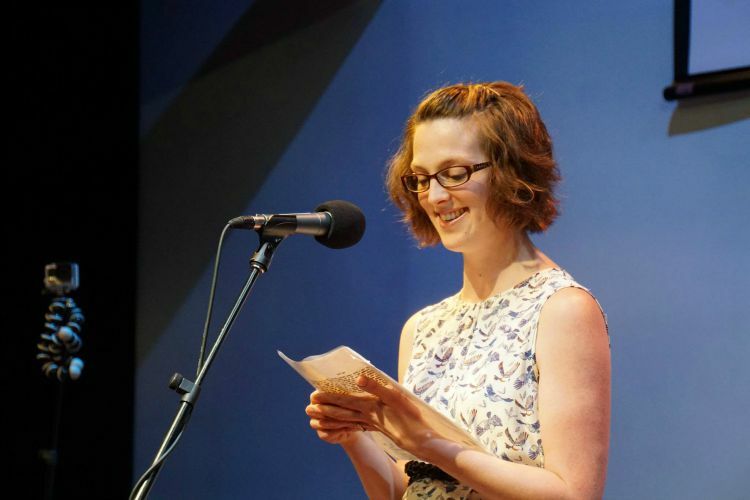 If you'd like to have a listen to her piece, written when she was just ten years old, you can check out the podcast episode below (and you'll also get the treat of hearing several other readings that were among my favourites for the night). Rosalyn is last, at around the 24-25 minute mark. So much thanks to Dan and Jenna - a lovely fellow former Stylelist Canada (RIP) alum that I got to meet in person! - for coming up with this genius podcast and for organizing the most enjoyable, hilarious and touching event I've been to in ages. Come back to PEI soon! !